Are You Curious About When to Pick Butternut Squash? Butternut squash that’s been harvested at exactly the right time has a wonderful nutty flavour. The texture is also perfect when it’s cooked. You can either mash it up with some butter, sugar & cinnamon; or simply cook it as lightly salted cubes. Either way, knowing when to pick your butternut squash is an important factor in the success of your cooking. Since Timing Is So Important, What Are The Seven Indicators Your Butternut Squash Is Ready? You and I will soon see that timing is everything when harvesting your butternut squash. 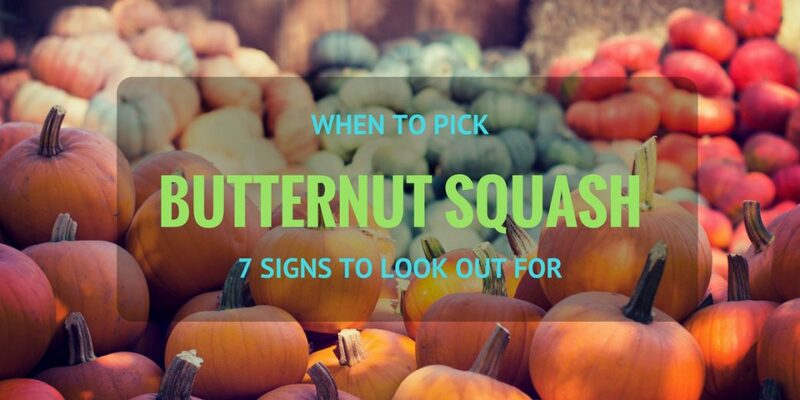 Let’s look at seven indicators your butternut squash is ready for picking. But first, let’s explore the detriment of either picking your butternut squash too early or too late. What happens when you harvest your butternut squash too early? How will you know when to pick butternut squash so that it retains all of the desired taste & texture qualities? Picking your butternut squash too early will result in the flesh being extra hard—even after it’s been cooked. More than that, the flavour won’t be as nutty as it could be. Instead, the flesh will taste bland. When butternut squash is harvested too early, the skin of the fruit will not have enough time to thicken. This will make it difficult to store your butternut squash for long periods after it’s been picked. What happens when you pick your butternut squash too late? This is equally as detrimental to the taste and texture of your vegetable. The biggest risk in leaving your butternut squash for too long on the vine is that bugs & parasites will attack it. There are many bug enemies of the butternut squash, so don’t give any of them a chance to get any. Another risk you run is the butternut squash being affected by frost. Since butternut squash is ready at the end of summer—mid autumn—too much severe frost may destroy the vegetable. But even if frost doesn’t hit, your butternut squash may rot on the vine if left too long. Before butternut squash is ready to be picked, you will notice a change in colour on the leaves. The plant’s leaves will either dull in colour (resembling a yellow tinge), or they will dry out and go brown. This is usually a good indicator that your butternut is ready. Be careful not to mistake the cause of drying leaves. Frost, bad soil composition and/or lack of water may also affect the leaves of your plant. Your butternut squash will have one main vine coming out of the ground. This vine will then network into slightly thinner vines which spread all over your garden area. By looking at these secondary & tertiary vines you should be able to tell if your butternut squash is ready—or at least almost ready. Towards the end of the plant’s life, the vines will begin to get thinner. They will start to shrivel slightly, which is indicative of enough nutrients being distributed to the fruit. This is a sure sign that harvest time is close by. The third sign to look out for is the stem that connects the butternut squash to the vine. This stem is usually stiff & supple. It holds the fruit onto the vine and prevents it from breaking off too easily if the plant is disturbed or shaken by harsh weather conditions. But towards harvest time, this stem will change its colour to brown, soften and even dry out. If this happens, you can be sure that there are almost no more nutrients being sent to the butternut squash itself. In other words, your squash is ready to be picked. While butternut squash is maturing, it will have a slight green tinge to it. There will also be green stripes along the fruit. If you see any of these characteristics on the squash, know that it isn’t yet ready to be picked. A harvestable butternut squash is a deep tan colour. That tan colour is the perfect indicator that your butternut squash has ripened. As mentioned, when butternut squash is given the time to ripen properly, it forms a hard exterior. This is one other way you can test to see when your butternut squash is ready to be picked. If it’s not quite ready, the exterior will have a slightly soft feel to it. If it’s ready, the skin will be thick and hard. This allows you to store your butternut squash for longer if it isn’t cooked immediately. Here’s a quick side note from me to you: It’s unfortunate when butternut squash is picked too early. But when it comes to gardening, trial and error plays a huge role. If your butternut squash was picked too early, the cooked flesh won’t be as tasty as it should be. If you picked it too late, the flesh will also have begun to lose its flavour. But if your squash was harvested at the right time—as per the indicators put forth above—the flesh will taste rich & nutty. If that’s how your squash tastes, you can safely follow the same pattern next time you harvest. Picking your butternut too early will prevent the flesh from softening even when it’s cooked. Mashing up your squash will leave it full of clumps which will be annoying to chew. On the other hand, if your butternut squash was overripe when you picked it, the flesh will be overly soft and extremely watery. Draining this water will do nothing more than remove most of the flavour you so desperately wanted to retain. Growing butternut squash is one of the easiest vegetables gardening endeavours you will experience. You will quickly learn how to recognise when butternut is ready to be picked. As you continue to grow this tasty squash, remember to keep a gardening journal so that the signs become clear to you year after year. Use the above seven pointers as a checklist and watch your butternut squash closely for these signs. The reward will be tasty butternut squash that’s not only tasty, but extremely healthy for you.